Author Thomas Saunders explores characters, writing, and the Tarot. Alan J Lerner, the lyricist and librettist for the great musicals (My Fair Lady, Gigi, Paint Your Wagon and many others) gave a masterclass at The Athletic Club of New York. When asked by the interviewer 'What creates a drama?’ he explained that without conflict there is no drama and in essence it is a three act play about the journey of the archetypal hero’s or heroine’s quest. How can that explanation help us as writers? In order to give readers a sense of drama and fulfilment, we can compose our narrative and develop our characters around this classic three act structure. Act One is The Call to Adventure. This sets up the conflict, their circumstances (their colour, creed, which side of the tracks they are born and so on) and their challenges. Act Two is Into the Woods. In all the classical myths and fairy tales the hero/heroine 'goes into the woods’ or a dark cave where they are faced with overwhelming challenges and circumstances. Here, the protagonists meet the dragons, giants and witches, do they cave in and retreat or do they confront these forces? These are the monsters Jung called the shadow; the unconscious forces that drive us. He said that until you make the unconscious conscious, it will direct your life and you will call it Fate. In other words, the universe will constantly present us with situations that will urge us to enter the woods that guides us towards self-discovery. One of the great modern fairy tales, The Wizard of OZ that fortunately escaped the Hollywood treatment, is the story of Dorothy, a brave and determined young woman who ventured into the woods and overcame the wicked witch who wanted to steal her dog Toto (her psyche). Theseus, the slayer of monsters hears about the Minotaur (a savage beast, half man, half bull who feeds off youths and virgins) lives in the dark cave of the secret tunnels of the labyrinth. Theseus’s conflict is not about killing the Minotaur but how to find his way back. Princess Ariadne, the feminine principal, gives him a thread of twine to trail out on his way down to retrace his steps back to the light (his transformation to consciousness). Act Three is The Return. Hamlet ('To be or not to be’) dithered, withdrew and succumbed to the challenges: his life’s drama ended in tragedy. Whereas Rosalind in As You Like It did confront and overcame the challenges: her life’s drama became a comedy. Our modern TV and film dramas, computer games and the traditional myths and fairy tales are the perennial stories of the hero’s/heroine’s psycho/spiritual journey. The drama is whether it all ends in tears and tragic despair or their quest ends in self-realisation and transformation. The exceptions are the genre of protagonists such as James Bond. Like Theseus, 007 does slay monsters and 'rescues’ virgins (so to speak), but psychologically, there is no transformation: he is always the same James Bond! The characters we create in our writings (the heroes and heroines; the goodies and baddies; the courageous and the cowardly) are the fundamental archetypes expressed in the coded enigmatic symbolism of an authentic deck of Tarot cards such as the Ancient Tarot de Marseille. It is one of several Mystery School teachings that perpetuate esoteric, philosophical precepts that charts the milestones and pitfalls we have to encounter and overcome and the lessons we need to learn to become a fully realised human being. A spread of the twenty-one cards in three rows of seven is the journey our characters make encountering the hazards and pitfalls and the lessons they must learn on the way. The significant 'mile stone’ is when our protagonist reaches the eleventh card called Force which illustrates a woman opening the jaws of a lion. At this point, the hero /heroine steps 'into the woods’. An 'authentic’ Tarot deck is one in which the symbolic language follows the conventions of grammar, syntax and vocabulary. In other words, there is no 'art-for-art’s sake and distinguishes it from the 'Angel’ and so-called 'Tarot’ cards that are now abundantly available and generally used for fortune telling which trivialises the intrinsic of essence of the imparted wisdom. Predicting some future event is based on an erroneous assumption that our lives are predestined from the moment we are born. 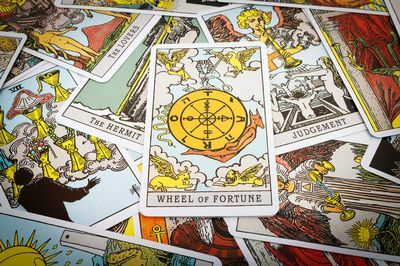 It feeds our expectations, hopes and fears whereas the Tarot should act as a facilitator to trigger our innate intuition. A reading deals with the present (where we are now on our own life’s journey) and taking the next positive step forward. The kindergarten kids were asked to draw their own version of Cinderella. The glass slippers became a pair of trainers but in essence they illustrated the same story. The zealots had completely ignored the profound symbolism...but the children’s innate insight and intuitive understanding ensured they fully understand the import of the story. Thomas Saunders is the author of Getting a Life and The Authentic Tarot - Discovering Your Inner Self.